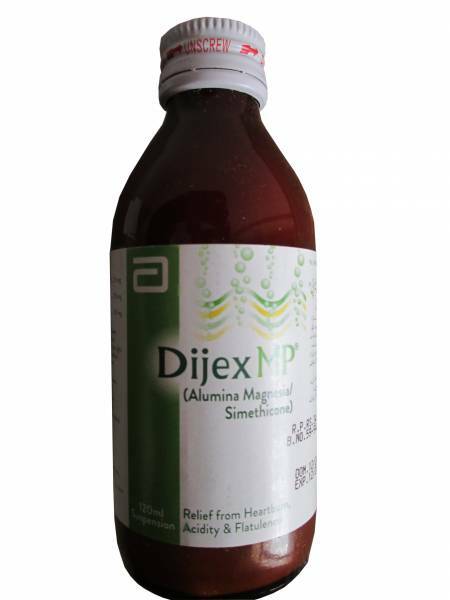 DIJEX MP is produced by Abbott, which contains Alumina Magnesia plus Simethicone. This syrup is mostly being given for the relief of Heartburn, Acidity and Flatulence. If you are facing heartburn, acidity and flatulence, all you need to take this syrup as a remedy. Whenever you take any heavy food and face heartburn and acidity, just take two tablespoon of this syrup as a remedy. mere pain ziada thi meny dijex mp ki full botal peee li ha kuch ho ga to nahi??? Khar ziada nahi pina chia tha..Itna masla nahi hoga. I have problem of eructation. Eructations continued even without eating any thing. What should I do? Drink plenty amount of water daily. Can a pregnant women take dejix mo for stomach problem like acidity, heartburn??? Yes a pregnant women can also use Dijex Mp for Acidity and Heartburn. I use dijex occasionally as it provides me relief from flatulence and subsequently relief from pain on right side of abdomen. Is there any side effect of using it frequently? If you are using occasionally then you don't need to worry. Sir abbu k pait ma dard ha.or wo bp k pationt bhe hain in ko gabrahat or bechani bhe ha.kia karain hum. Kuch din pehla tak in ka cretinine ziada tha ab behter ha jis ki waja sa pain kilar band kia hoa tha or bp k tab bhe kha rahe hai.magar kamzori gabrahat ha or 2 din sa pait ma bhe dard ha. Pait ma dard k lia Entamizole dadoh. Is digex safe during pregnacy for severe acidity ? 17 mah sy mede k masly me ho Mede me jalan dard or tezabiyat bht hoti hai. bhaly me dalya hi q na khalo. is ki waja sy ges hoti hai or is ka dard itny hissy me ghomta rehta hai or Tezabiyat ki waja sy nind bht aati hai kuch kaam karny ko dil nai karta ghabrahat bht hoti hai koi b kaam karo to bht jaldi thak Jata ho khana b bht der me hazam hota hai sans Phol jata hai. Doctor actually i have a weakness of blender…. so which madican i can use? dr sahab my mother has gall bladder stone problem. she is diabetic, heart patient and hypertensive as well.. she gets severe pain in stomach which moves towards chest, shoulders and it takes sometimes half an hour to releif from pain, dr suggest digex mp for pain releif .what you suggest for her? ?